What Makes a City Tier in China? We often hear of China’s first or second or third tier cities, yet what actually makes a city tier? The terms are so often used, yet there is actually no official formula for determining what tier a city falls in. Instead, everyone makes up their own rules. There are a few common views on which Chinese cities fall in which tier, often pointing to population, development of services and infrastructure, and the cosmopolitan nature of the city. First tier cities are naturally the fewest and easiest to find common ground on. China’s four city municipalities (Beijing, Shanghai, Tianjin and Chongqing) are candidates as a clearly-defined group of leading cities. Yet this group doesnt hold up in terms of the development and stature criteria mentioned above, and in their stead a different quartet is often put forward: Beijing, Shanghai, Guangzhou and Shenzhen – four huge metropolises with well-developed property markets. It becomes much more trickier when we move down to second tier cities. According to Xavier Wong, head of research at the Knight Frank real estate office in Hong Kong, to be considered in the second tier, a city should have a population of at least three million and a minimum GDP equivalent to USD 2,000 per capita. By this definition, back in 2007 when Wong made the calculation, there were about 60 Chinese cities that qualified as second tier. In addition to the simple population and income guides, according to Wong, the cities should also have a strong history of exports, a robust record of foreign direct investment and good policy initiatives. This seems at least a more robust definition than simply grouping China’s 28 provincial capitals as the second tier cities, as some (including apparently AC Nielsen) have done before, and grouping prefecture and country level capitals as third tier cities. Due thus to the fact that there are many different views on what delineates a city tier, some have ditched the term altogether. A China consumer study published in 2009 by consulting firm McKinsey, for example, recognised the limitations of using city tiers, and opted to use a classification of city clusters instead, which are groups of cities that are developing around one or two large cities. 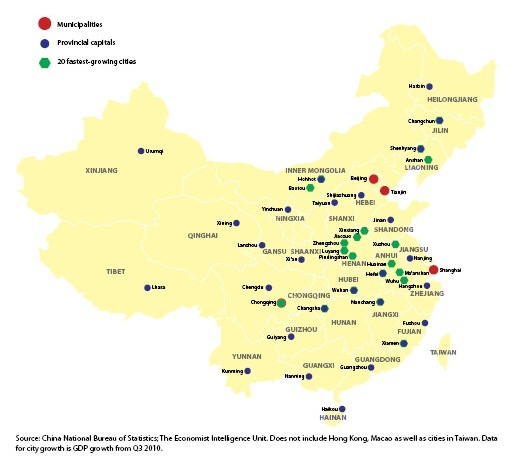 The report identified 22 such clusters in China, divided into groups of mega, large and small (for the full report and map showing the clusters, click here). Dividing China’s cities into different tiers has obvious advantages, as it can illustrate how economic development is moving inland or westwards in China, and how China’s large metropolises are being gradually matched by cities with rapid economic growth yet that are not yet quite as big or have as many people. The idea seems simple and practical enough. Yet the snag of using the tiers system is in setting the exact parameters for them, because with so many different classifications being used, the result is confusing and contradictory. So the only way to go about it if you really need to divide all China’s cities into tiers, is to put forward (your own) clear formula for what makes a first tier city and especially what makes a second or third tier one. Perhaps its just case of 'know one when you see one' to define a second or third tier city - not exactly a science. Then again you can opt to sidestep the whole tiers issue altogether, like McKinsey did. Yet it seems that ‘tiers’ have made such a strong impression on foreign observers of China that the confusing term will be with us for a long time still, in its various guises. This article first appeared on the China Sourcing Blog.